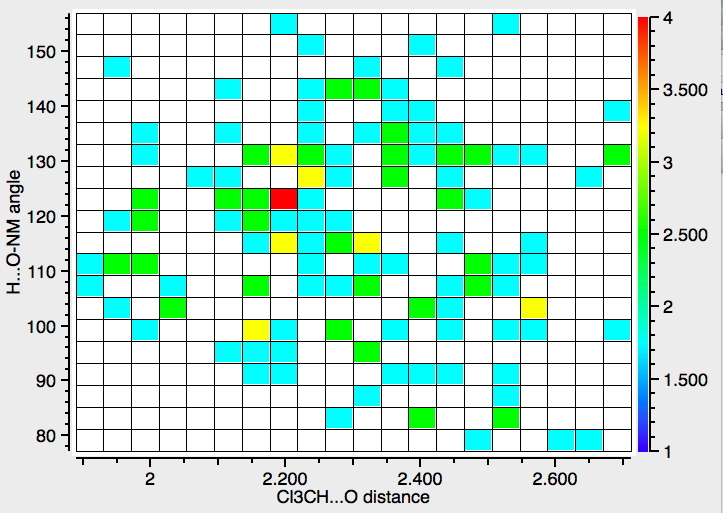 This first search (R < 0.05, no errors, no disorder) is for interactions from the CH… O, and is a plot of that distance against the angle subtended at the oxygen. Note that there are not that many crystalline examples. 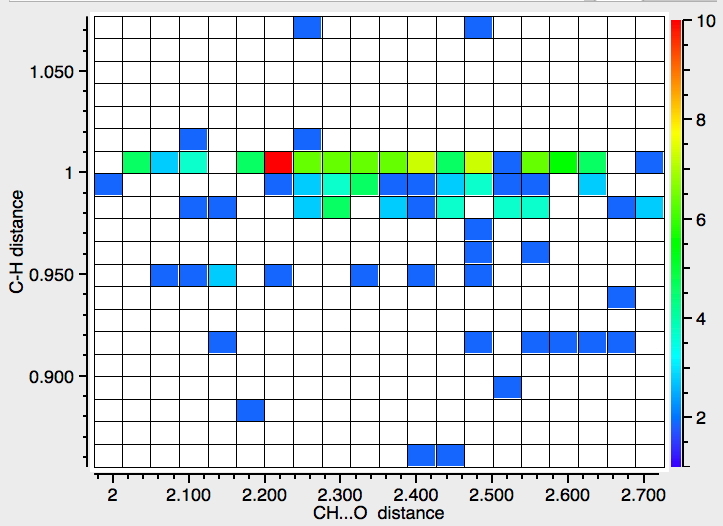 The “hotspot” is at a distance of ~2.3Å, but real examples down to 1.9Å exist. The angle subtended at the oxygen is close to 120° (the angle subtended at the hydrogen is always close to 180°). The plot below constrains the search to data collected below 140K to reduce the thermal noise in the measurements, with the hotspot shortening slightly to 2.2Å. The next search is for interactions to N rather than O (T < 140K). There are rather fewer hits, but again with similar features. 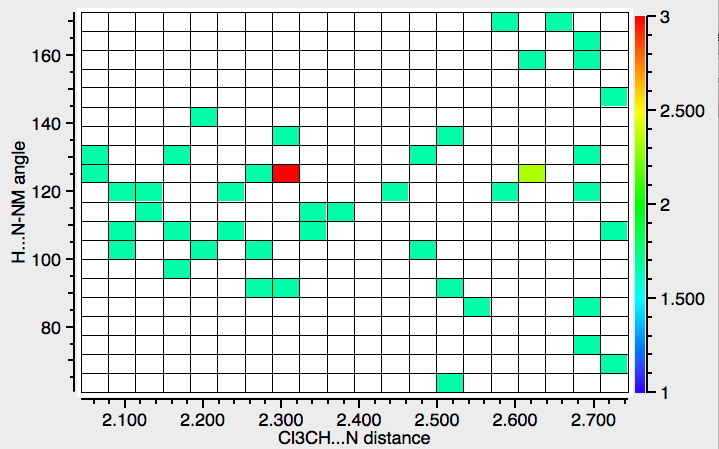 Finally, an attempt to see if there is a correlation between the C-H length and the H…O length. This has odd characteristics, which suggests that in most cases the C-H distance is not measured from the diffraction data but simply “idealised” (and which therefore renders this plot meaningless). 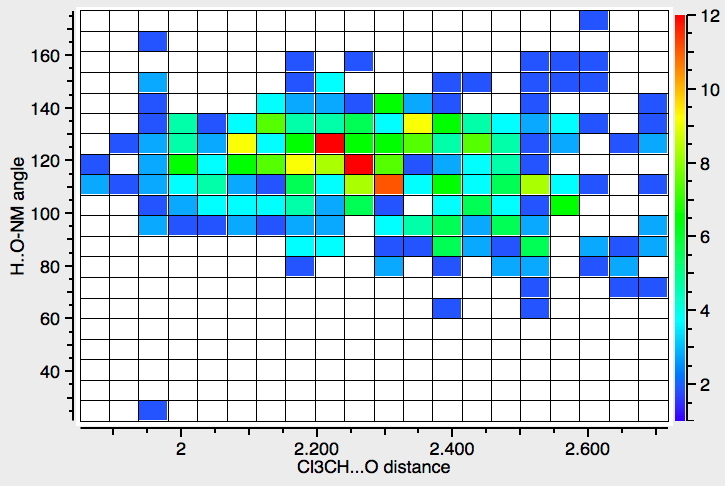 Unless its been added recently, it is not possible to specify in the search how the hydrogen positions have been refined, if at all and hence to restrict the search only to those structures where the C-H distance is meaningful. In the last ten years or so, great progress has been made in assigning experimental spectra with the help of quantum calculations. This is true of chemical shifts in NMR, but especially so for chiroptical measurements such as ORP, ECD and VCD. Given that explicit hydrogen bonds can introduce anisotropy into the otherwise isotropic solvent continuum, it might be worth including perhaps one chloroform molecule into these calculations, especially if the CH…O distance is <2Å (which suggests it is fairly strong). If nothing else, chloroform is rather big and might exert effects based on dispersion attractions or steric repulsions as well as the H-bonding. This entry was posted on Monday, November 14th, 2016 at 5:21 pm and is filed under crystal_structure_mining. You can follow any responses to this entry through the RSS 2.0 feed. You can leave a response, or trackback from your own site. Hydrogen bonding to chloroform. is licensed by Henry Rzepa under a Creative Commons Attribution-Noncommercial-Share Alike 3.0 United States License.